Park and carry the small drone in the heart of the multi-functional transmitter itself while you travel. The advanced altitude holding technology allows the drone to suspend in the air hands-free when you let go of the remote. 3 Fun stunt moves* and tricks can be performed with one button to make your flight even more impressive. Easy takeoff even for beginners with the one-key touch that will lift the drone up in midair. Integrated apps available on iOS/Android. See and save real-time FPV First Person View footage right from your phone. Headless flying mode and speed select make it easier to adjust to any user's flying skill level. 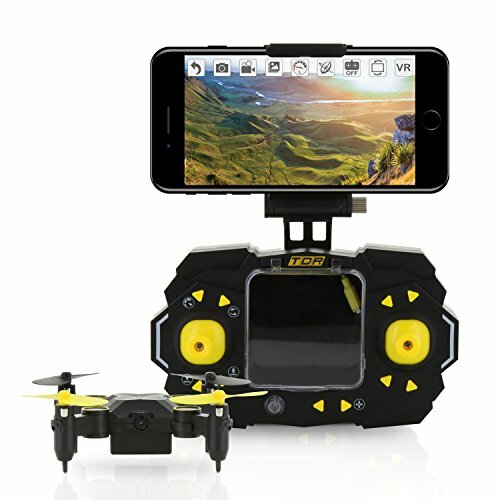 Size: 5.7 x 3.3 x 1.3"
STABILIZED DRONE FOR BEGINNERS - Auto hovering is an altitude holding technology that lets the drone stabilize and suspend in mid-air automatically, even when you let go of the controls. One-key, one button touch for takeoff and landing. Features making it the perfect tiny drone for beginners, children, and drone newbies. DOCKING TRANSMITTER - Special Docking Transmitter is a 2-in-1 carrying case and transmitter. Park and carry the mini RC drone in the heart of the multi-functional transmitter itself while you travel.It is really a small and portable remote control drone that makes your trip easier. ONE-KEY STUNT MOVES - This mini pocket drone can perform 3 fun stunt moves and tricks with one button and make your flight even more impressive. Stunt moves including: 360 degree flip, a tornado spin, and orbit flying tricks. FPV FROM INTEGRATED APP - Integrated apps available on iOS/Android. See and save real-time FPV (First Person View) footage right from your phone by using this App controlled drone. This mini drone with camera live video allows you to view what the drone sees, as if you are sitting inside the drone itself. FLEXIBLE FLYING OPTIONS - Thanks to the headless mode drone, control of this drone is easy and you do not need to worry about the direction of the drone when flying it. You'll have total control for a straightforward flying experience.The speed select help make it easier to adjust to any user or pilot's skill level.Built-in Micro USB charging port makes charging your X20 drone as easy and convenient as charging your smartphone. You can also charger the mini quadcopter drone use USB via computer. If you have any questions about this product by Tenergy, contact us by completing and submitting the form below. If you are looking for a specif part number, please include it with your message.